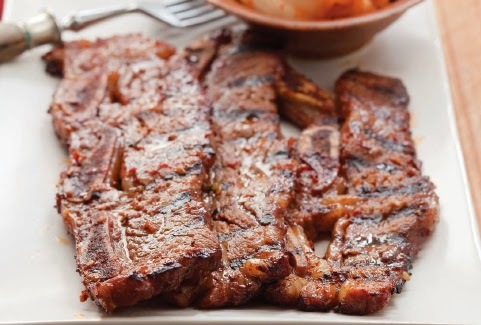 All Korean grandmothers have their own little secrets for making and tenderizing kalbi. Soda, sugar, and Asian pears are all common tenderizing agents. Your butcher may also have the similarly cut flanken-style or cross-cut beef chuck short ribs; just ask if the slices can be cut a little thinner. 1. Using your hands, massage the short ribs with the kiwi purée. Sprinkle each piece evenly with sugar and let sit while you make the marinade. 2. In a medium bowl, mix together the soy sauce, garlic, ginger, sesame seeds, sesame oil, honey, red pepper powder, pepper, and soda. Place the ribs in a single layer in a wide shallow pan and pour the marinade over, turning to coat. Cover with plastic wrap and marinate in the refrigerator, turning occasionally, for at least 1 hour, or preferably 12 hours. 3. Prepare a medium charcoal fire (you can hold your hand over the rack for no more than 3 or 4 seconds) with the rack 4 to 6 inches from the coals, or preheat a gas grill to medium. While the grill is heating up, drain the ribs from the marinade. Reserve the marinade for basting, if desired. 4. Brush the grill rack with oil and grill the ribs in batches until they turn caramel brown and develop slightly charred edges, 6 to 8 minutes on each side. 5. Baste with the reserved marinade during the first 10 minutes of grilling if you like. 6. Serve with freshly steamed short-grain rice and cabbage kimchi.